Hangtimer – Dude, How Long Was I Up There? | OhGizmo! Hangtimer – Dude, How Long Was I Up There? If you fancy yourself an ‘extreme’ athlete but have always wondered just how extreme you actually get then the Hangtimer will at least provide you with some tangible measurement. The carbineer style watch can be clipped to any part of your clothes or gear and uses a built-in tri-axis accelerometer to determine your hang time whether you’re riding your snowboard off a cliff or jumping your BMX bike off a sweet ramp. Besides the mention of the accelerometer the website is unfortunately a bit vague as to how the device actually works preferring to answer that question in the FAQ with “It’s Rocket Science.” Something tells me though that’s enough of an answer to satisfy their target demographic. The watch is powered by 2 AAA batteries which means unless the accelerometer is really power hungry it should run for quite a while without needing a new pair. The timer function can recall the last 10 hang times and will also store the best and average times so you can keep track of your progress. 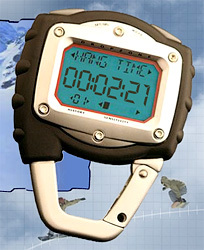 The watch also includes time and date functions, a manual stopwatch and a digital thermometer. The Hangtimer is currently available on the company’s website for $99. Freefall (or hang time) is the point at which a body is accelerating toward the earth at the same rate gravity is pulling them toward the earth. Since these two forces are opposite, then the individual feels absolutely no “gravity” or acceleration, even though they are accelerating toward the ground. The accelerometer measures acceleration in three axis. If you place it on a table, it will measure 1G of acceleration just sitting there, because gravity is pulling it downward, but it can’t move due to the table, so it can sense the force. If you drop it then it will experience no force internally until it hits the ground, at which point it will experience a force several times normal 1G, and then the normal 1G once it has stopped bouncing. So the accelerometer in the hangtimer simply looks at all three accelerometers, adds up the total acceleration, and if it’s 0, then it starts a timer until the acceleration suddenly spikes (landing) and settles at 1G again. Thanks Adam, that was extreamly helpful! Is airtime different then hangtime? If my resoning is correct, this device only starts counting at the point you start falling? In answer to your question Austin, it does measure from the moment you leave the ground till the moment you return (going up and coming down).